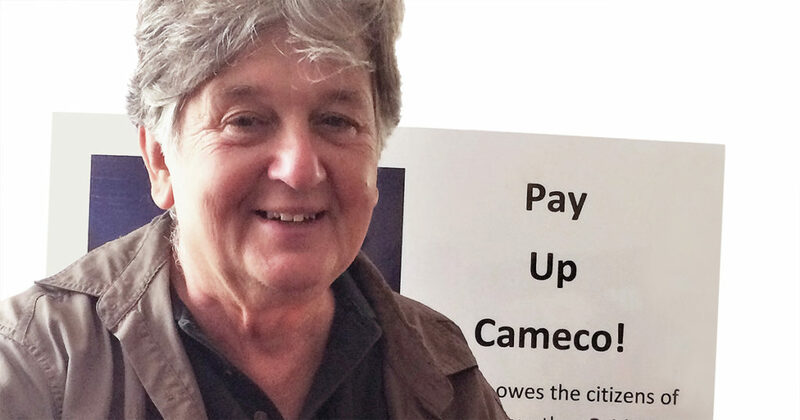 Saskatchewan citizens are conducting an ongoing campaign to have Cameco – one of the largest uranium companies in the world – pay the $2.2 billion bill that it has accumulated in unpaid taxes. Through donations to hospitals, sponsorship of charitable causes, and bringing in performers like Sarah McLachlin, Cameco has perfected its “Cameco Cares” image of social responsibility. The flip side is much darker. Despite enormous profits over many years – with the help of a tax avoidance scheme, Cameco has caused disruption in the lives of many communities of northern Saskatchewan. Last year the Rabbit Lake mine was closed down, resulting in the loss of 500 jobs. More recently, another 120 jobs have been lost in Cameco operations at the Cigar Lake, McArthur River, and Key Lake mines. Half of people working for Cameco in the North are First Nations or Metis. Cameco argues they are not making enough money. The Moteley Fool, a financial advisory web page, describes how Cameco works its finances: “During a six-year period ending in 2012 Cameco’s Canadian operations racked up a cumulative $1.3 billion in losses. Meanwhile, over the same period, the company’s Swiss subsidiary recorded $4.3 billion in profits.” What exactly is going on? It all dates back to 1999. Cameco set up a subsidiary in Luxembourg, eventually moving it to a low-tax jurisdiction in Switzerland. It then entered into a 17-year contract with that subsidiary, one that would see Cameco’s Canadian operations sell its uranium to its Swiss subsidiary. The price per pound would be fixed for the entire time and “reflected market conditions,” as put by CFO Grant Isaac in 2013. Cameco is before a CRA court right now to ascertain their guilt in this method of tax avoidance. CRA started looking at Cameco in 2006 – taking ten years and many delays to get to this point. A petition campaign supported by Canadians for Tax Fairness, Sum of Us, and Saskatchewan Citizens for Tax Fairness received over 36,000 signatures. It called on the Federal and Provincial governments to have Cameco pay up. Cameco’s tentacles go wide and deep in controlling any sort of opposition in Saskatchewan. During a recent Cameco lockout of workers a short video was done on the line interviewing Cameco workers. For one day it circulated on the internet and contained a comment about health and safety conditions in the mines. A worker asked that it be taken down out of deep concern about Cameco’s reaction. Even though Saskatchewan is in the midst of an economic crisis Premier Wall refuses to pursue the monies owed by Cameco to the Province of Saskatchewan. An estimated 800 million or more could come back if Cameco paid what they owe. That would certainly take the pressure off all the cutbacks and other destructions happening to Saskatchewan’s social and other infrastructures, and particularly communities in northern Saskatchewan. When one sees the closure of the Nortep program in northern Saskatchewan, the community of La Loche still waiting for crisis support services and people who can find housing to live in their community, the freeze and cut backs on 64,000 government workers, the ending of the affordable housing program, cutbacks on healthy baby/healthy mother programs etc – one sees the trail of destruction of Cameco not paying up the millions upon millions they owe to the Saskatchewan people. The Premier of Saskatchewan has lauded Cameco as the driver of development in the northern Saskatchewan. In 2013 he described Cameco as the best program for First Nations and Metis people. But, seeing Cameco leading them through a boom and bust economy, communities in northern Saskatchewan are asking for much more. In response to the most recent Cameco cutbacks, Bucky Belanger, NDP MLA in northern Saskatchewan, underscored “the need to expand tourism, forestry, oil and gas development and other industries in the north”. The problem with areas of “development” such as oil, gas, and forestry is that they still are a part of a boom and bust economy and extract resources from a community without giving much back. In the late 1900’s there were some real efforts to bring communities of the North together to look at how they would build their own Indigenous economy that would support jobs and resource wealth staying in the north. There is a real need to revive and build on those discussions. A northern economic and social plan done by and with communities of the North would go a long way in reducing the dependency on multi-national corporations that extract but do not give back. The Cameco situation raises important concerns and questions for Saskatchewan citizens about tax evasion, and Cameco’s sales of uranium internationally also raise serous moral questions that Saskatchewan citizens need to address. The uranium sale a year ago to India – and lauded by Premier Wall- was to a country that has refused to sign the nuclear non proliferation treaty. Cameco should be answerable and accountable on many fronts including tax dodging, the instability of communities that rely on Cameco as a single source of employment, the health and safety of uranium miners and their communities, the impact on the environment of uranium extraction, and the potential dangers of selling uranium on international markets.